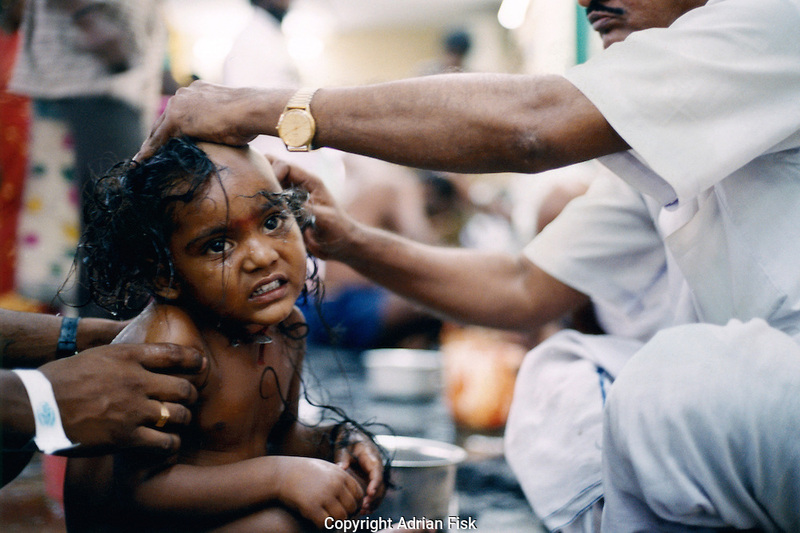 In the temple grounds at the Sri Venkatasvara temple in Tirupathi south India a young child sacrifices their hair to the god Vishnu in thanks for his blessings. The temple sits on the summit of a wooded hill 2,000ft above the town of Tirupathi. Buses groan around hairpin bends, laden with pilgrims, but the more rigorously devout ascend by foot, through the groves of Mango and Sandlewood, chanting the names of the gods as they go. The barbers, who work in the open air, come into view as one rounds the last bend. In the past competition was ferocious. Barbers would pounce on pilgrims as they got out of the buses, shaving a strip of hair off as many heads as possible to maximise the scalps committed to them, then returning to finish the job later. Today it is more organised, though only less frenetic.